The Caldera Premium Villas is located on the cliff, in the center of Oia, and offers views of the volcano, a pool and accommodation decorated in the Cycladic style. Please inform Caldera Premium Villas in advance of your expected arrival time. For this, you can use the special requests section when making the reservation or contact the accommodation directly. The contact details appear on the booking confirmation. To check in at Caldera Villas, carefully read the instructions that Caldera Villas will send you once the reservation is confirmed. Studio with private or semi-private terrace or balcony overlooking the Caldera, the volcano and the Aegean Sea. It has air conditioning, satellite TV and kettle. Open-plan studio with private or semi-private terrace or balcony overlooking the Caldera, the volcano and the Aegean Sea. It has satellite TV, kettle and air conditioning. Suite with satellite TV, an electric kettle, air conditioning and a balcony or terrace with views of the Caldera, the volcano and the Aegean Sea. Some suites are open plan. Traditionally decorated suite with air conditioning, mini fridge and balcony or terrace with views of the Aegean Sea, the volcano and the Caldera. It has a living room with satellite TV and a bathroom with free toiletries and a hairdryer. Free WiFi is provided. This suite offers a balcony or terrace with views of the Caldera, the volcano and the Aegean Sea. It also has a private hot tub. There is satellite TV, kettle and air conditioning. The room will be assigned at the time of check-in, depending on availability. During the stay there may be a change of room. The rate includes a free continental buffet breakfast, all taxes and maid service. 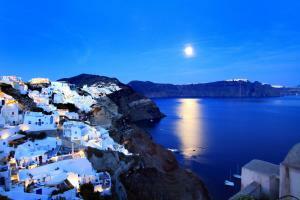 Suite with private terrace or balcony overlooking the Caldera, the volcano and the Aegean Sea. It has a bedroom with a king-size bed and a private spa bath. It includes satellite TV, air conditioning and a kettle.